I’m a bit behind the curve on most things: I never own the newest gadget; I never know the latest gossip; I never get a joke until it’s too late to laugh. However, I usually manage to do a little better where food is concerned, which is why I was a bit taken aback by the miracle that is fennel. It’s not as if it’s a brand new food. Humans have been eating fennel for centuries. The Romans may have been the first people to cultivate the vegetable, and they liked it so much that they planted it virtually all over their empire. Of course, I’ve heard of fennel before, seen it in stores, and encountered recipes for it, so you would think that I might have eaten it before my 42nd year of life on this earth. Well, some things elude us. 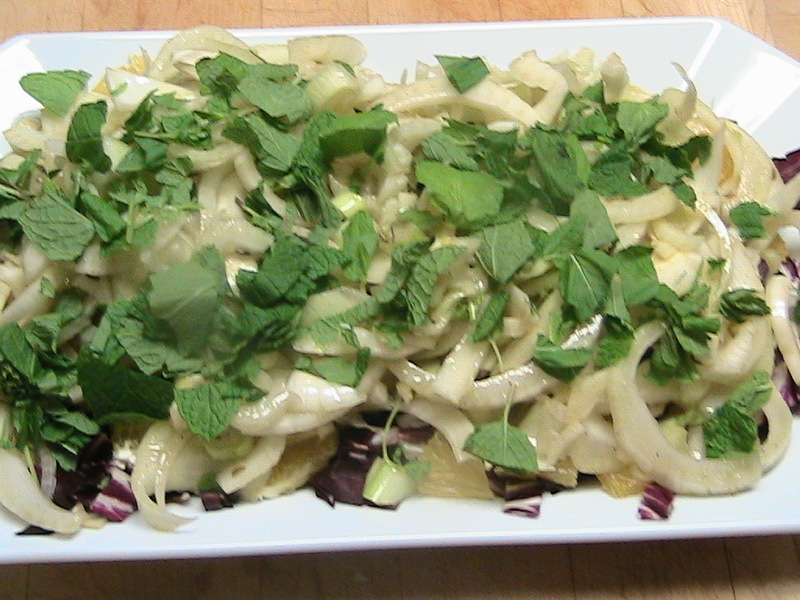 Acting on a whim, I made a salad with fennel to serve at a party that we had recently. It was the hit of the evening, I think, perfect alongside fried latkes and cheesy liptauer. It has become a family favorite. Now that I have eaten it, I plan to eat a LOT more of it, especially since it’s in season and there are great heaps of it at my local produce market. Fennel is crunchy and refreshing — just the kind of food to eat during the dark days of winter. Although it can be braised, sautéed, and caramelized, I think fennel might be best raw, in salads, where it retains its intensive crunch. Of course, I’ll be testing this hypothesis for as long as the fennel stock holds out. In the meantime, here’s a salad recipe that I adapted from one archived at epicurious. com. We’ll be having this for dinner tonight as we observe our unoffical Meatless Monday. Scatter the radicchio on a large serving platter. Place orange slices on top To make the dressing: whisk to combine the sherry vinegar, mustard, and salt & pepper. Continue to whisk while adding the olive oil in a slow drizzle. Toss the dressing with the fennel. 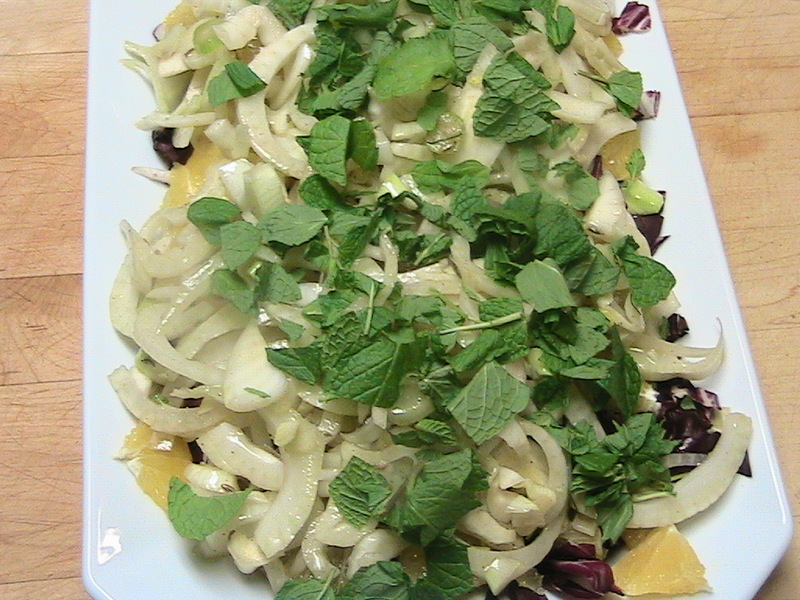 Place the fennel on top of the radicchio and oranges. Scatter the mint leaves on top of everything. The salad can be made 30 minutes before eating; refrigerate if, like me, you prefer salads to be quite cold. Serves 4 as a main course.